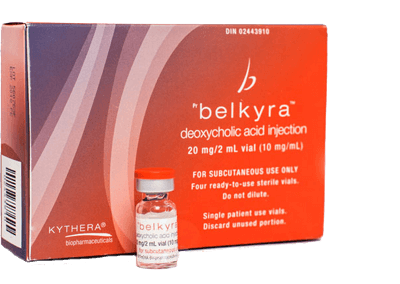 Belkyra contains deoxycholic acid as the active ingredient, and is an individually tailored, non-surgical injectable that permanently and effectively eliminate and destroys fat cells under the chin, which are then processed through the body’s natural disposal pathways. Belkyra, also known as Kybella, helps create a more contoured neck and jawline to redefine the profile. Belkyra is being injected in small amounts in several locations of the treatment area approximately every 4 weeks for up to 6 treatments or until the desired result is achieved.